Synchronization of alternator means connecting an alternator into grid in parallel with many other alternators, that is in a live system of constant voltage and constant frequency. 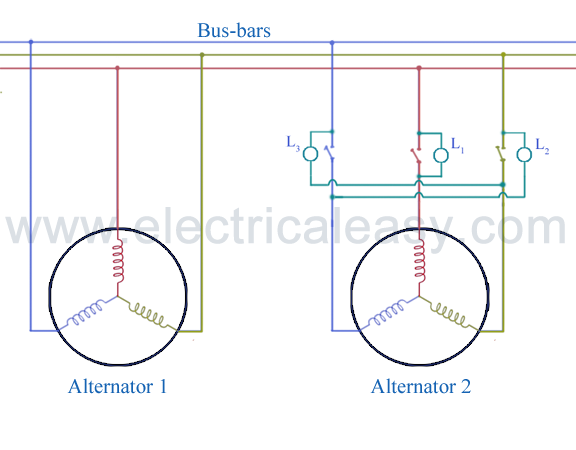 Many alternators and loads are connected into a grid, and all the alternators in grid are having same output voltage and frequency (whatever may be the power). It is also said that the alternator is connected to infinite bus-bar. Equal voltage: The terminal voltage of incoming alternator must be equal to the bus-bar voltage. Similar frequency: The frequency of generated voltage must be equal to the frequency of the bus-bar voltage. Phase sequence: The phase sequence of the three phases of alternator must be similar to that of the grid or bus-bars. Phase angle: The phase angle between the generated voltage and the voltage of grid must be zero. When the speed of the alternator 2 reaches so that, the frequency and phase rotation of output voltage is similar to that of the grid voltage, lamp L1 will go dark and lamps L2 and L3 will dimly but equally glow (as they are connected between different phases and due to this there will be phase difference of 120 degree). The synchronization is done at this very moment. This method of synchronization is sometimes also known as 'two bright and one dark method'. Synchronization by using incandescent lamps depends on the correct judgement of the operator. This method does not tell how slow or fast the machine is. To use this method for high voltage alternators, extra step down transformers need to be added as ratings of lamps are normally low. 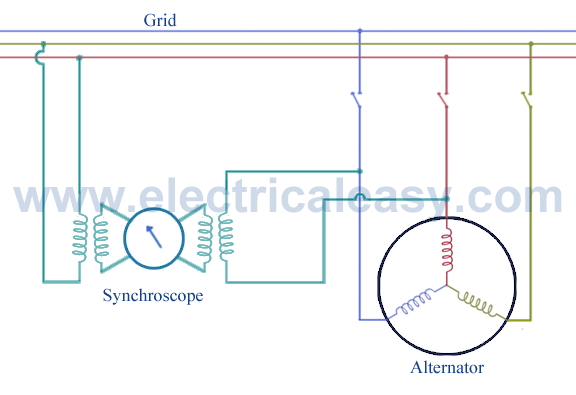 A synchroscope is a device which shows the correct instant of closing the synchronizing switch. Synchroscope has a pointer which rotates on the dial. The pointer rotates anticlockwise if the machine is running slower or it rotates clockwise if the machine is running fast. The correct instant of closing syncronizing switch is when the pointer is straight upwards.